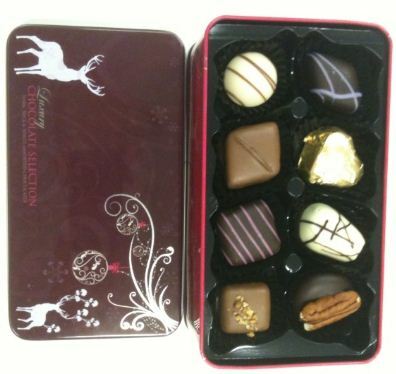 This tin, with its Christmas stags and bauble decorations, absolutely protects the chocolates nestled within. I had to share these with the office after the cupcake chocolates – it was only fair. There is a selection of 2 layers boasting the same selection: Pistachio Mousse, Violet Creme, Cafe Noix (personal favourite), Strawberry Cheesecake, Milk Caramel Heart (too sweet for me but went brilliantly with my gingerbread latte), Roast Nut Praline, Raspberry Caramel and Marc de Champagne Truffle. The chocolates are a mix of dark (strawberry, violet, cafe), milk (heart, roast nut, raspberry) and white (pistachio, champagne) and so there will be enough to share with everyone something they’ll like. The flavours are strong (except the strawberry which didn’t have that signature sweet sickly fake strawberry flavour which is good) and yet not overpowering. While not Paul A Young, these are nonetheless a decent box of chocolates. In fact, I’m currently considering buying some for the family! Look for the tin and grab a small one – 16 chocolates and while not top notch, still decent quality.